Pizza Peel Crisp, crunchy mouthfuls, the pungent smell of oregano, and melted mozzarella hanging in long, chewy strings. 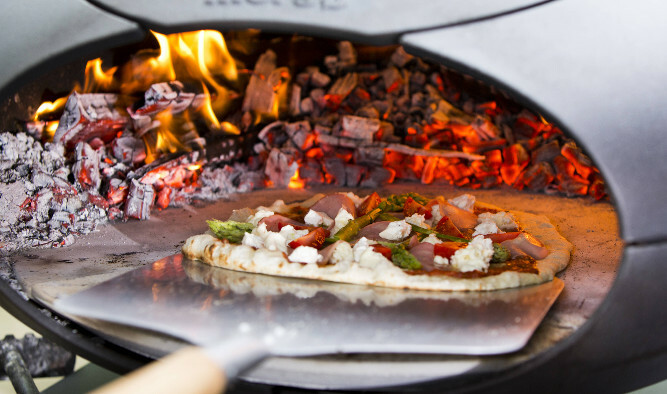 Do as Bornholm`s uncrowned king of pizza and TV chef, Gorm Wisweh: bake gourmet pizzas in your Morsø Outdoor Oven! The Outdoor Oven gives you the right conditions to make a real Italian pizza baker jealous, and this pizza peel helps you move one marvel after another in and of the oven, right under the impressed noses of your guests! The pizza peel is made of aluminium with a wood handle specially designed for the Morsø Outdoor Oven by award-winning Danish designer Klaus Rath. Gorm Wisweh is also the author of a book of pizza recipes, which gives lots of ideas to send your taste buds direct to Italy.